Different winged eyeliner styles create absolutely stunning effects, making a face more attractive and eyes become big and beautiful. 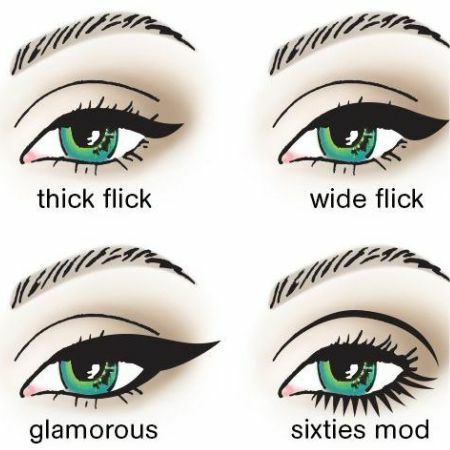 Here we are going to describe the most popular winged eyeliner styles. 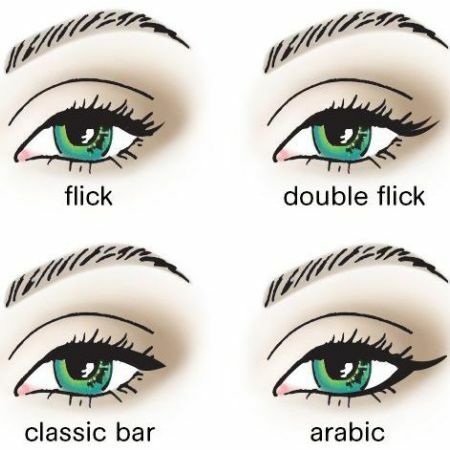 ★ The oriental winged eyeliner style is characterized by the fact that the upper and the lower lines are not connected to each other; they are parallel and slightly rising to the temple. ★ To achieve the cat eye look, glide your eyeliner along the root of your lashes, moving from the inner corners of the eyes outwards. The eyeliner for this look should be smoothly rounded, connecting the outer corner of the eye and extending a quarter of an inch beyond the eye with a graceful bend. Like Marilyn Monroe’s seductive cat eye, the wing will become thicker and thicker toward the outer edge, and the tip will remain rather short. ★ The Cleopatra tilt involves lining the entire upper and lower eyelids. The eyeliner starts off thin near the nose, gradually thickens in both the upper and the lower parts, and then ends with a raised sharp corner. ★ Creative wings are the choice for bold and daring girls; they give your eyes a fantastic, unusual appearance. You can try experimenting with flowers, stars, butterflies, or geometric shapes designs. These styles are ideal for certain types of parties. ★ Thick and intense wings are also suitable for parties and not used in the daily makeup. When making such wings, it’s best if you outline the shape first and then fill the space with the eyeliner. ★ The thin v-shaped eyeliner look is the simplest and most common type of winged eyeliner. This style is suitable for daytime makeup. All you have to do is apply a thin coat of eyeliner to your upper eyelid and slightly increase the volume as you get closer to highlighting the corners of your upper and lower eyelashes. ★ Another winged eyeliner style involves lining the entirety of your upper eyelid, and then applying eyeliner from the middle of the lower eyelid. The eyeliner on your lower lid should be thin. This technique makes the eyes look bigger and more expressive. Whatever type you choose, the line should be made as close as possible to your lash line. Avoid putting eyeliner on your lower eyelids only as doing so looks vulgar and ridiculous. For evenings out, you can emphasize your eye makeup with the help of pearlized eyeliners that have some shimmer and glitter to them. Generally you can use bright colors, but you should try to avoid using glitter for day makeup. Like the article «Winged Eyeliner Styles»? Share it with friends!